Nomination forms are available online at www.lamarcc.edu/alumni-relations and must include the nominee's name, complete contact information, summary of education & career, special interests, and any other information that would assist the selection committee to appraise the nominee's achievements and how his or her success began at LCC. Nominations are due April 11. Last year, Ruth McKenney and Robert (Bob) Gourley were selected as LCC's outstanding alumni. McKenney attended the Junior College of Southeastern Colorado, the name under which LCC was founded, and graduated in 1940 as part of the second-ever graduating class. Gourley attended LCC in 1968 and was awarded an honorary degree at last year's Commencement ceremony. Both individuals have been heavily involved in the agriculture industries and are pillars in their respective communities. 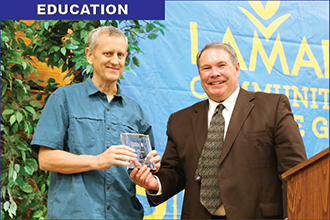 Recently, LCC honored Lawrence Brase and Dale Specht in 2016, and Bill Buxton and Gary Turpin in 2015. LCC has honored over 40 former students in the past twenty-nine years. To see the full list, visit www.lamarcc.edu/alumni-relations.